Next in the series on SlantShack Jerky is their Original variety with Jerk McGurk's Wild Rubdown. See last week's review of their Original beef jerky, plain. 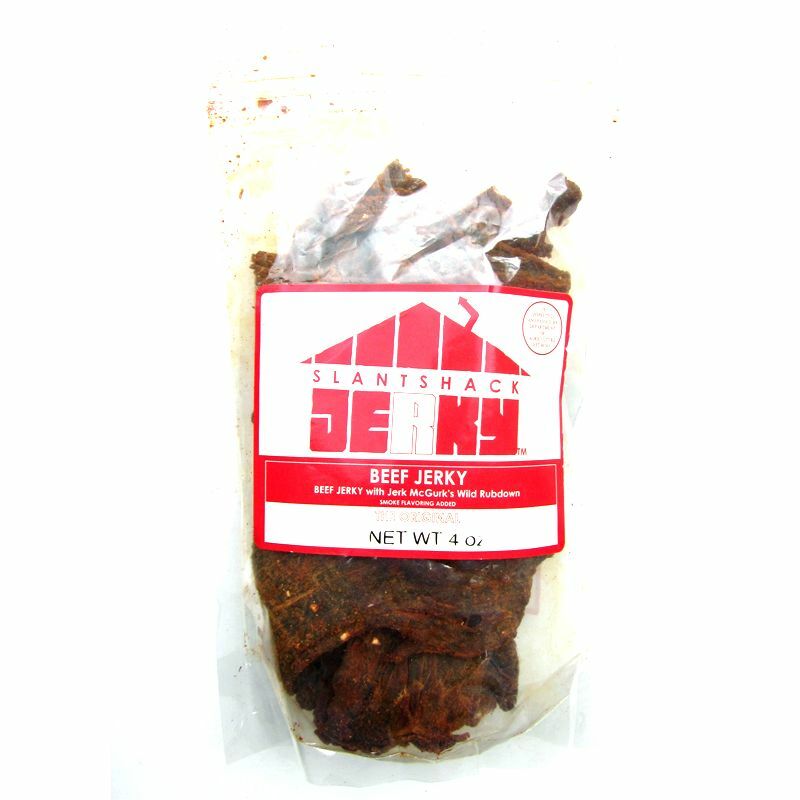 SlantShack Jerky is a brand of SlantShack Jerky, LLC based out of Jersey City, NJ. The company, which has been selling it's jerky to the public for a year now, was the creation of Josh Kace, a Columbia University graduate who brought in some friends to get the business going. The company offers a "Build A Jerky" feature on their website where you get to choose your jerky upgrades and options. Today's review is based on their Original beef jerky, but with Jerk McGurk's Wild Rubdown, which is described as a blend of cayenne pepper and brown sugar. It costs an extra $1.00 per 4oz package to get the Jerk McGurk's. Beef, brown sugar, soy sauce, salt, paprika, worcestershire sauce, white vinegar, honey, molasses, ginger, real garlic, black pepper, cayenne pepper, liquid smoke, onion powder, cumin. The first thing I taste from the surface of these pieces is a good deal of seasoning, primarily the paprika, a light bit of the cayenne pepper, and cumin. There's also a light touch of worcestershire. The chewing flavor starts with a slightly increased sweetness, and a more defined worcestershire flavor. A tanginess is well noticeable, along with a light natural meat flavor. For being described as the company's Original beef jerky with "Jerk McGurk's Wild Rubdown", it certainly does have the flavor of the plain Original with an additional dusting of seasoning. SlantShack Jerky only says that it's a blend of cayenne pepper and brown sugar, but doesn't make any claims about it being more hot, or more spicy, or more sweet, or what. What I can tell you is that I do taste some extra flavors than what I reviewed last week with their plain Original. Those extra flavors seems to be mostly the paprika and some extra sweetness. I can taste some of the cayenne, it's just a faint flavor. It doesn't really add much heat, though I can feel a little bit. After eating several pieces, it builds up to what I would consider "mild-medium" on my personal hot scale (level 2 out of 5), though I can see how persons less tolerant of hot foods might see this a level higher at "medium". Otherwise, the dominant flavor in this is the worcestershire sauce, but more sweetened than the plain Original. The rubdown seasoning competes well against the worcestershire initially, but slowly wears off and towards the end of the chewing is all but gone, with the worcestershire still continuing. The natural meat flavors are lightly noticeable when I take the time to think about what I'm tasting. If I just snack away on this jerky I don't really notice it much. There are some bits and streaks of fat that do add a burst of fatty flavor that becomes quite noticeable. The tanginess in the chewing is not quite as strong as what I found in the plain Original, though it's still there to a lesser degree. Perhaps the heavier sweet, or the rubdown seasonings help compete against it. Or maybe it just varies from batch to batch. And like with the plain Original, I'm getting the small bursts of ginger as my teeth bite into one of the small bits on the surface of these pieces. The cumin is also noticeable too. The level of saltiness in this feels to be at a low to medium level. Overall, what you're going to notice in this jerky is a sweetened worcestershire sauce flavor, seasoned with a good dose of paprika, and lighter amounts of cumin and cayenne, along with a slight bit of heat. You'll get a tanginess in the chewing, and random bursts of ginger, all on top of a light natural meat flavor. These are slices of whole meat, sliced into thin slabs, and in medium to large sizes. 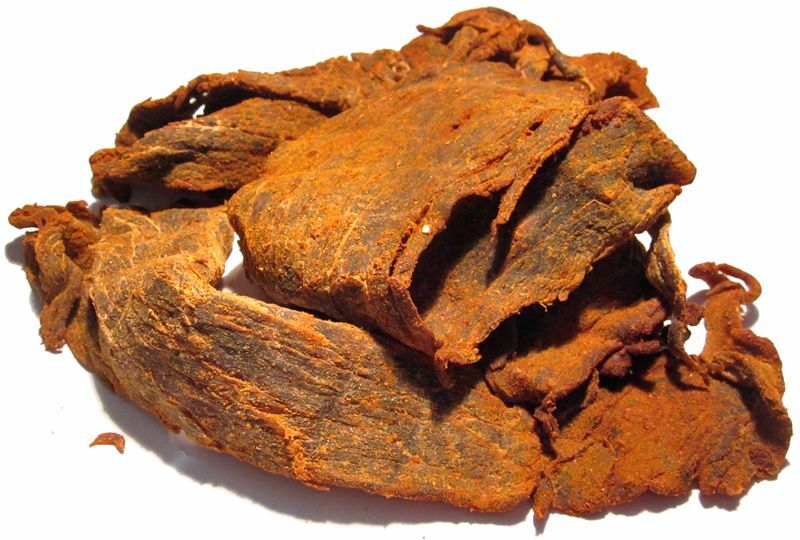 This is a dry jerky, with a dry surface feel due to the dusting of rubdown seasoning. These slabs are very flexible, being able to bend a full 180 degrees on itself with no cracking. Tearing these slabs apart with my fingers is very easy, and chewing seems very easy as well. The chewing texture starts out feeling soft and tender, with just a little chewing resistance. It chews down to a soft mass quite quickly and easily, and at that point, it feels very much like chewing a piece of steak, one cooked well-done. I found several streaks and bits of fat on these slabs, enough to create a fatty flavor where I bit into some. I also found streaks of gristle on one slab, while the other pieces seemed void of any. There's also a fair amount of stringiness in this, and I'm finding plenty of unchewable tissues remaining in my mouth. In terms of clean eating, my fingertips pick up a lot of seasoning requiring me to rub my fingers together before touching my keyboard. I'm also getting a lot of meat fragments and seasoning dropping on to my lap. 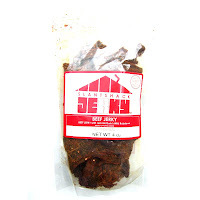 Slantshack Jerky sells this Original with Jerk McGurk's Wild Rubdown through its Build A Jerky website at a price of $11.00 for a 4oz package. Shipping is approximately $6.00. If you bought four packages, it would total $50.00, or a price of $3.13 per ounce. For general jerky snacking purposes, at the $3.13 price per ounce, it's a decent value. I'm getting a lot of snackability from its great overall flavor, easy eating, and good chewing texture. That price is very high compared to major brands of jerky you'd find in grocery stores, but clearly offers a better snackability. As for paying an extra $1.00 a 4oz bag to get the Jerk McGurk's Wild Rubdown, I think it's a judgement call. I still found the plain Original to be quite enjoyable, while having this Jerk McGurk's added to it doesn't really make it that much better in my opinion. If you happen to like sweet jerky, then it's worth it. I'm one to prefer spicy hot jerky, but this doesn't quite add enough heat for me to justify paying the extra $1.00. 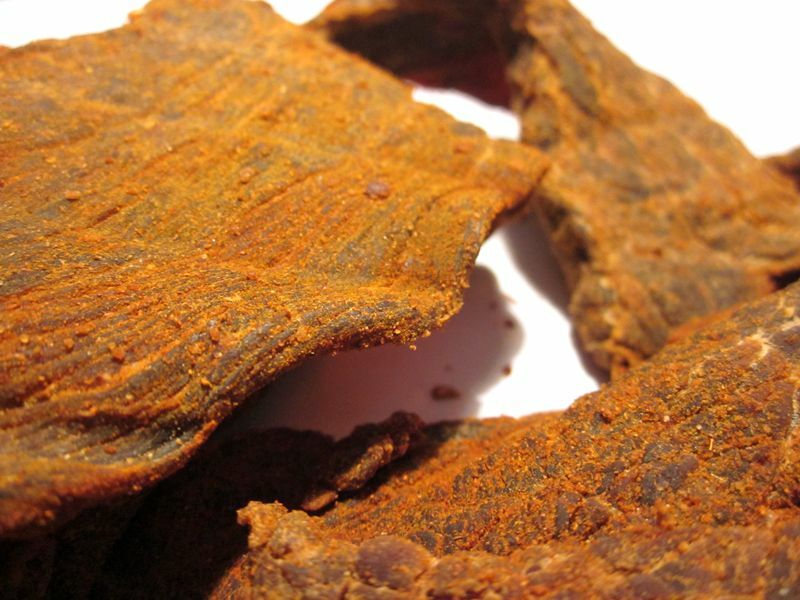 This Original with Jerk McGurk's Wild Rubdown is very much like the SlantShack's plain Original jerky, but with more sweet, along with some paprika and light cayenne pepper flavoring. The rubdown gives it a little bit more surface flavor, and just a slight bit of kick, and is perhaps perfect for folks enjoy something spicy, but not too spicy. Last week I gave SlantShack a best rating for their plain Original, and this really isn't that different. Because it adds a little more spice, and because I like spicy jerky, technically it's a little better. Though being sweetened up more might make it better for some folks, it doesn't necessarily make it better for me. I thought the lighter sweetness in the plain Original was fine. I didn't get as much tanginess in the chewing with this than I did with the plain Original. Assuming this is the same exact jerky as the plain Original, but with some extra sugar and spice, I'm not sure why it would be less tangy. But there's still a well-noticeable tanginess. And like with the plain Original, the meat consistency seems good overall. It's easy to tear apart, and easy chew, and feels like I'm chewing a real piece of meat. The unchewable wads of tissue remaining in my mouth is a negative for me, but when I put everything together, it's just a minor thing. Overall, I think it's an awesome jerky. As for my recommended beer pairing, I still like the porter with this. But go with a drier porter so as to let the sweetness in the jerky be more dominant. Stick with the Stone Porter, or do the Sierra Nevada Porter.